8/17/2010Share this story on Facebook! 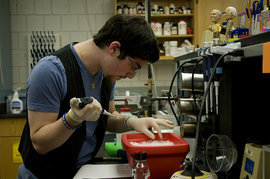 Phil Feinberg '11 is a bio lab prep worker on campus. Long gone are the days where you have to wait until graduation to dive into your career. Ithaca College’s on-campus employment options help students build confidence, résumés, and bank accounts. Biochemistry major Philip Feinberg ’11 can be considered a jack-of-all-trades, balancing his studies, internships, research outside of class, and his on-campus jobs as resident assistant, student researcher, teaching assistant for Organic Chemistry I & II and Principals of Biology, and a lab technician. From sterilizing supplies to helping students conduct experiments and research, Feinberg is on the fast track to his career aspirations. Rachel Allen ’12, a communication management and design major, works at the ITS help desk, where she’s helped a professor who was having technical problems with his lecture and eased the mind of a student whose computer has just crashed. At her campus job, Greenberg develops specialized exercise programs for her clients and helps them learn proper form, skills that will be valuable in her ultimate goal: to become a physical therapist. “As a freshman,” says sound recording technology major Kevin Harper ’11, “I took every opportunity I could to get acquainted with our systems and learn as much as I possibly could about recording techniques in general.” Now the student manager of recording services, Harper oversees 30 student workers and the recordings of the approximately 400 recitals and concerts at the School of Music each year. As photography lab monitor for the Roy H. Park School of Communications, journalism major Marianne Dabir ’11 answers students’ questions, troubleshoots printing and technology problems, and mixes chemicals in the wet process rooms. Allyson Hotchkin ’11, an integrated marketing and communications major, works as a sales manager for Ithaca College’s student-run newspaper, the Ithacan, and has already seen the benefits of her campus job. “It is rumored to be the best-paid job on campus,” jokes Hotchkin, who works on commission. But this job offers more than great pay; it provides real-world experience. Working with paying clients and using computer programs such as Adobe InDesign and Photoshop have given Hotchkin familiarity with the basic skills she needs in her marketing classes. In fact, this sort of experience makes her a great candidate for a layout position right out of college, something she hopes to pursue post-graduation.